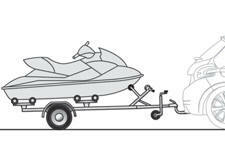 Towbar suitable for the attachment of a trailer or installation of a bicycle carrier, with additional lighting and signalling. We recommend the use of genuine PEUGEOT towbars and their harnesses that have been tested and approved from the design stage of your vehicle, and that the fitting of the towbar is entrusted to a PEUGEOT dealer or a qualified workshop. If the towbar is not fitted by a PEUGEOT dealer, it is imperative that it is fitted in accordance with the vehicle manufacturer's instructions.